Much going on in many areas. We been doing projects related to radio, literature, a new animation related to one of the holy days, and various international issues. Last Sabbath I was in Muhuru Bay where I met our new congregation. The service was very excellent. It was fine time when I met pastor of Maranatha church who after hearing the truth from the Bible decided to leave the position of pastorship and follow the truth. George Ochuodho who served Maranatha church for many years as a pastor made the decision to follow the truth. After the services, we discussed with him more about the true God. He wanted us to go and visit him at his home. Since I had some trips to make, I sent Granton Otieno from Migori to go and meet them. He did that yesterday. He met him and his family. But there was another man also who was interested in God’s church and they were much in need of our books especially church history. I promised to send that book on this week. I called XXXXX who wrote to you about the books. We negotiated with him that he will come home this week to collect the books. XXXXX is a Catholic, but God is calling his people to his church. We shall share with him more this week. Today we visited Mbani. Our member from Oriang congregation Jane Obambo lost her eldest son. Tomorrow we shall go and mourn with her. The month of November and December will be very busy. I wanted to visit all congregation in Rift valley. According to the programmes in Rift valley. In December we shall have youth camp in Kenya. We are having programmes to visit Zambia to meet our congregation leader in Zambia Justine Gonakumoto from Zambia about the work there. I will see if I can call in Malawi to finish up our programmes in that country. We have many people in Malawi who wanted to be baptized. We also plan for that baptism. As can be seen in the photograph above, they meet outside under trees for services. I am from Gendia mission hospital in Kendu bay to see deacon Kennedy Odhiambo from Oyugis. I am still on the way home. The man is very sick. He is suffering from meningitis. His status is not good. He needs more prayers from brethren. Please pray for him. Also I will go to Rift valley on Friday to start my visitation. I want to go to see Pastor Sawek’s home to see the state of his house and see how to help him. prayer that we shall soon build a church with your support. We hope the word of God will spread in entire Rift Valley. They also are meeting outside. The whitish cloth is covering a piano. Anyway, we are pleased that there is interest in Kenya. Much is going on in Africa. Greetings from Malawi, Mozambique and Zambia. I would like to thank you for the great support you are sending to us to help the work of God. May God Bless you. Thanks for the funds you send to us to buy Bibles for the Brethren who cant afford to buy and ironsheet ,cement to roof Sunuzi Congregation. Brother Louis Wahela who is leading Sunuzi congregation. Chiefs and the whole church has sent the words of thanks to you for the ironsheets and now they will worship at good place with no rainfall problem. They are requesting you if you get time come to worship with them. The project is still in progress. ROOFING SUPPORT OF CHURCHES WITH GRASS ROOF IN MOZAMBIQUE. 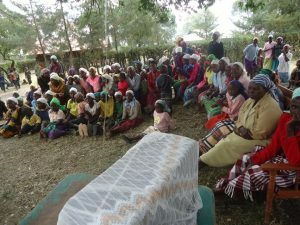 Pastor get to know that when we put a church roof made of grass, it means that every year there is a need to renovate since the guarantee for the grass and plastic sheet its one year. So this year I have managed to buy plastic sheet for the roofing of the following congregation in Mozambique. It means that next year they will need to have plastic sheet again. Its my prayers that in future the God who has provided ironsheet for Sunuzi under your leadership will continue doing what he has started. The bibles we ordered from Bible society of Malawi ,we are expecting to get them on 1st November 2018. Since we don’t print Bibles in Malawi they are done outside Malawi so it takes time to get them when you place an order. When we get them I will notify you with the pictures. The work of God is growing in the way that God is opening many doors. I have two new congregation joining us. I was in Mozambique from 12 to 15 october 2018 for the distribution of plastic sheet. This coming week am going to mkwamba (nyasa provincial) in Mozambique to visit the Brethern who come to the Feast of Tabernacle 2018 using their funds. ( 100 dollars to and from mkwamba). Pastor pray for me since it’s a long journey that will take two days on road using buses. Pastor let me remind you about the prayer book which we translated and sent to you. The leaders has asked me how far is the book since is of great important to them. Pastor transportation is becoming a problem since the work is growing amazingly so to hire a motorcycle is becoming expensive becoz some places public buses cant go even you cant use pushing bicycles. It become a headache when they need you to visit them. Its my prayer that if we will have our means of transport it will be easy since the cost will be fuel only, prayer with me that god will make a way. The attachment its for Sunuzi roofing, roofing plastic sheet pictures for Mozambique. 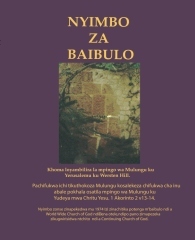 We have a version of the Bible Hymnal in Chichewa, that we sent some copies to Malawi before, but it is incomplete and flawed as far as I am concerned. Furthermore, the problem is that it cannot really be fixed in a normal editing way, because Chichewa is not a language supported by Kindle Direct Publishing (the merging of CreateSpace is hurting us here). So, someone in Malawi would need to retype what is right and then also type the missing parts, based on translating the English edition. Anyway, we are trying to work on this, but it will take time. I was on the radio on the NutriMedical Report on October 30th with Dr. Bill Deagle. We discussed why Christians should not celebrate Halloween and said to think celebrating it helps Christianity is a false gospel. Also, for those interested in looking at written information related to Halloween, here is a link the article: Is Halloween Holy Time for Christians? and here is a link to our free online book: Should You Keep God’s Holy Days or Demonic Holidays? Dr. Deagle has offered to have the CCOG on one hour per week, every week, at no cost. We have tentatively agreed to try this, despite certain reservations I have about it. Of course, we realize that Jesus associated with people of a variety of backgrounds. 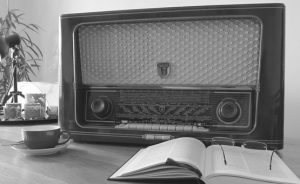 The radio hour would be each Thursday from about at 2:06 – 2:59 pm Pacific time. This is to begin today. In addition to me being on the program, a couple of other men in CCOG have also agreed to do the show when I am not on it. Radio is one of many ways we use to reach people around the world. Note: This feature is currently available only in the United States. Users may see information from third parties, including Encyclopedia Britannica and Wikipedia, alongside videos on a small number of well-established historical and scientific topics that have often been subject to misinformation online, like the moon landing. An information panel providing topical context may appear in search results or on the Watch page of videos. It will include basic, independent third party information about a given topic, and will link to the third party partner’s website to allow viewers to learn more about the topic. This information panel will appear alongside videos related to the topic, regardless of the opinions or perspectives expressed in the videos. 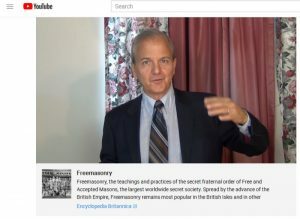 This is disturbing for many reasons, including the fact that I did not provide factually inaccurate information about Freemasonry. We are concerned about anti-biblical bias, and this includes not only YouTube, but biased third parties like Wikipedia (who call the Exodus a myth). Several months ago, we contacted another channel about putting our videos on it, but they were so overwhelmed by requests that they have not gotten far enough along for us to load our videos there. We have known for a couple of years that we needed another option other than YouTube. This is one more reason why we need to try to accomplish that. That being said, the ‘warning’ from YouTube did not seem to reduce views of the sermon. But their move still was disturbing. In a few days, the latest round of US sanctions against Iran are supposed to go into place. Iran is upset and is hoping that the Europeans will help them. While Europe is looking at ways around the US dominated international banking system (see Iran charges USA with ‘economic warfare, but perhaps sanctions are not so ‘swift’) and some day will do so (consistent with various prophecies), right now the Europeans are trying to see how to trade with Iran without getting massive retaliation from the US. A murderous man killed 11 people at a Jewish synagogue in the USA (see ‘The Pittsburgh Synagogue Attack: What We Know’). Antisemitism is not limited to Europe. Plus historically, Church of God members have also sometimes been targeted because of biblical practices such as Sabbath keeping. More attacks and persecution are coming. German Chancellor Angela Merkel announced that she would be stepping down as the head of her party by 2021. Some believe that this will cause instability in Germany (see Germany’s Merkel out in/by 2021: ‘Don’t underestimate the instability the passing of the Not-Quite Iron Chancellor will engender’). Biblically, we expect instability in Europe and that this will lead to a reorganization that will result in the rise of the Beast of Revelation (Revelation 17:12-13). The timing of this leader’s future rise may coincide with Angela Merkel’s decline in influence. Brazil elected a new president and some feel that this could result in the rebuilding of a massive third Jewish temple in Jerusalem (see Brazil elects Jair Bolsonaro: ‘First Stage in Building the Third Temple?’). Some others have pointed towards Donald Trump being an end time ‘Cyrus’ who could for help cause that (see CT: ‘Is Trump Our Cyrus?’). While a massive third temple in Jerusalem is NOT required for animal sacrifices to resume (cf. Ezra 3:6), the political will to allow such sacrifices basically is needed (see Why is a Jewish Temple in Jerusalem Not Required?). We know that animal sacrifices must start as biblically we are told that they will stop (Daniel 9:27; 11:31). It will require political changes for them to begin, and likely the confirmation of a particular ‘peace deal’ such as alluded to in Daniel 9:27. Perhaps it should be pointed out that the King of the South (Daniel 11:40) will arise prior to the breaking of the deal in Daniel 9:27. Now, while there are still issues with the Palestinians and Jordanians (see Palestinians votes to suspend recognition of Israel; Jordan wants farms back from Israel), it may be that the situation in Saudi Arabia could change and also help pave the way for the coming King of the South (see Are things fine in Saudi Arabia? Or might there be a coup?). Sermonette, which for most who receive this letter via email will be a recorded one. The one suggested for this week is: Europe makes Antichrist move. Other sermonettes are available at the Bible News Prophecy channel. Sermon, which for most who receive this letter via email will be a recorded one. The one suggested for this week is: Proof Jesus is the Messiah: Certainty. Other sermons are also available at the ContinuingCOG channel. Other sermons are also available at the ContinuingCOG channel. Brethren, we are God’s workmanship and were created to be engaged in good works. God has good works (cf. Genesis 1:31). Walking in God’s way helps build character. Let us all strive to better walk in God’s way.